School Of Midwifery, Federal Teaching Hospital Abakaliki [SOM FETHA] Admission Form, Admission Requirements, Application Guidelines, Entrance Examination Date, Time and Venue for 2018/2019 Academic Session. 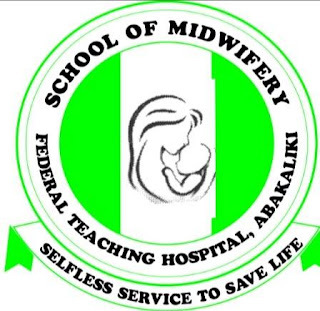 This is to inform the general public that Admission Form into School of Midwifery Federal Teaching Hospital Abakaliki (SOM FETHA) is on sale from 1st July - 7th December, 2018. • Take the receipt with two recent passports and O' Level Result(s) to the School registration officer for further but offline processing.